It’s a frothy time and during such times people can develop a tendency to get sloppy about their numbers. The first sign of froth is when people routinely discuss company size using market capitalization instead of revenue. This happened constantly during Bubble 1.0 and started again several years ago – e.g., all the talk of unicorns, private companies with $1B+ valuations. Oneupsmanship becomes the name of the game in frothy times. If your competitor’s site had 1M pageviews to your own site’s 750K, marketing quickly came up with a new metric on which you could win: “we had 1.5M eyeballs.” This kind of gaming, pardon the pun, is seen through rather easily. The more disturbing distortions are those intended to impress industry influencers to validate strategy. Analysts – whose job is supposedly to analyze – have a troubling tendency to not judge strategies on their logical merits but on their results. So if vendor has a silly, unfocused, or simply bad strategy, the vendor doesn’t need to argue that it actually makes sense, they just need find a way to show that it is producing results – and the ensuing Halo Effects will serve as validation. Public companies try to demonstrate results through revenue allocation games, robbing from non-strategic SKUs to pump up strategic ones (e.g., “cloudwashing” as the megavendors are now often accused). Private companies have free reign and can either point to unverifiable lofty financing valuations as supposed proof that their strategy is working, or to unverifiable sales growth figures where sales is typically defined as the metric that looked best last quarter. Most people would quickly agree that at a SaaS business, the best metric for measuring sales is growth in new annual recurring revenue (ARR). They’d also agree that the best metric for valuing the business is ending ARR and its growth. (LTV/CAC would come in right behind.) Using my leaky bucket analogy, the best way to measure sales is by how fast they pour water in the bucket. The best way to measure the value of the business is the water level of the bucket and how fast it is going up. But it’s a frothy time, and sometimes the numbers produced using the correct SaaS measures don’t produces numbers that, well, sufficiently impress. So what’s a poor CEO to do? Embellish. The Wall Street Journal recently ran a piece that compared company claims about size/growth made while the company was still private to those later revealed in the S-1. The results were disappointing, if not perhaps surprising. Put differently, what’s the SaaS equivalent of “eyeballs”? The answer is simple: bookings or, more precisely, total contract value (TCV) bookings. To show this, we’ll need to define some terms. NSB = new subscription bookings, the prepaid (and – no gaming — quickly collectible) portion of the contract. Since enterprise SaaS contracts are often multi-year and can be fully, partially, or only first-year prepaid, we need a metric to understand the cash implications of the deal. 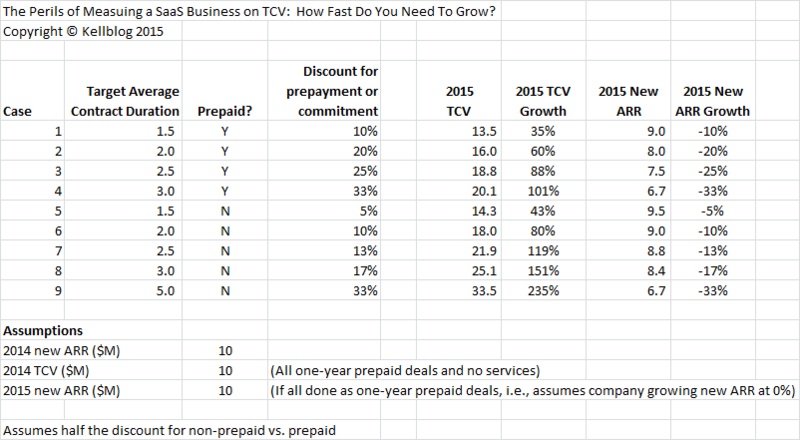 TCV = total contract value, including both prepaid and non-prepaid subscription as well as services. TCV is the largest metric because it includes everything. Some people exclude services but, to me, total means total. Note that in each case, the ARR is $100K. But by varying deal terms the TCV can vary from $150K to $750K. Now in the real world if someone was going to pay you $100K for one-year deal, they are unlikely to pay $300K for a three-year prepay or contractual commitment. They will want something in return; typically a discount. If you switch to TCV, the good news is you can grow literally as fast as you want just by playing with contract terms. Want to grow at 60%? Switch to 2-year prepaids and give a 20% discount. That’s not fast enough and you want to grow at 101%? Move to 3-year prepaids by effectively doing a year-long “buy 2 get 1 free” promotion. That’s not good enough? Move to 5-year non-prepaids and you can grow at a dazzling 235% and get nice TechCrunch articles about your strategic vision, your hypergrowth, and your unique culture (that is, most probably, just like everyone else’s unique culture). The discounts you’re giving to get multi-year deals are crushing ARR; new ARR growth is shrinking in all cases. The prepaid deals create a drug addiction problem because you’re not collecting cash in the out years. So you build a dependency either on lots of capital or lots more prepaid deals. Worse yet, on the non-prepaid deals you may not ever collect the money at all. In my opinion, non-prepaid multi-year deals are often not worth the paper they are written on. Why? Just look at it from the customer’s perspective. Say you sign a $100K five-year deal with only the first year paid up-front. And say the software’s not delivering. It took more work to implement than you thought. You’ve fallen short on the requirements. It’s not performing very well. You’ve called for help but the company can’t fix it because they’re too busy doing other 5-year non-prepaid deals with other customers. Since software companies generally don’t like suing customers, the vendor – especially if they know the implementation failed – will generally walk away and write it your receivable as bad debt. If they are particularly devious (and incorrect) they might not even take it as churn until the end of the five-year period when the contract is supposed to renew. I wouldn’t be shocked if you could find a company that did it this way. Most sophisticated SaaS people know that SaaS companies shouldn’t be run on TCV or bookings and are well aware of the problems doing so creates with ARR, revenue, and cash. However, I have never heard anyone make the simple additional point I’m making here: in a frothy environment dubious companies can create a fictitious bubble around themselves using TCV. However, because non-prepaid multi-year deals only work when the customers are happy, if the company is out over its skis on promises and implementations, then many of the customers will not end up happy, and the company will never collect much of that TCV. Meaning, that it was never really “value” in the first place. Beware Greeks bearing gifts and SaaS vendors talking TCV. This entry was posted in Metrics, SaaS, Startups, Venture Capital. Bookmark the permalink. Good article. I have not come across but you are right. A very bad measure for SaaS. Suspect it is a legacy of licence software models. Would produce bad incentives and worse results. I have closely witnessed this behavior after spending 10 years in Subscription based companies’ operations. This is more prevalent when the sales function inherently drives the company and when the sales incentives are tied to bookings and not ARR. We had to write off non-prepaid invoices for the following excuses by customers “software not meeting our needs” or “CTO who signed the contract is not with the company” or “we are going through a restructuring” or “We are reviewing our software license contracts”.